Back at the office, we soaked the small clams in salted water, and threw in some flour to hopefully tick off the clams and force them to disgorge any uglies they may be harboring within. The clams did indeed appear to be from relatively clear waters, and they didn’t spit out much sand or other debris. 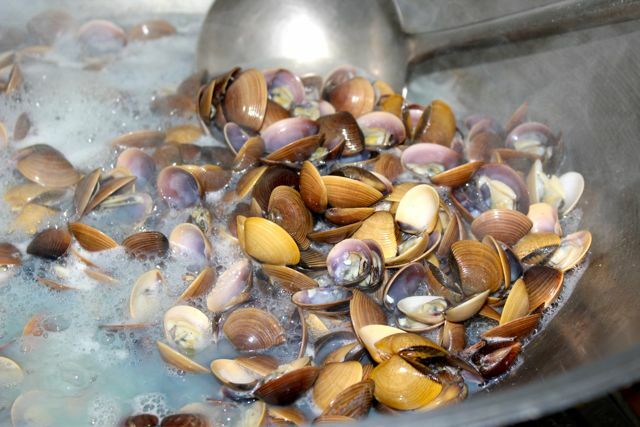 Into a very large kawali or wok, I added about a cup of water, turned the burners onto super high, and when the water was boling, added the three kilos of clams and covered them up for a minute or two. The clams opened up nicely, and I removed the clams, boiling down the broth to concentrate the flavors, and to yield about 1.5-2.0 cups of liquid. Strain the clam broth through paper towels and a fine sieve. Meanwhile, pick out roughly 2/3 of the shells and discard them, leaving just some of the clams in their shells and lots of clam meat. Wipe down the wok/pan, place back on the burners over medium heat, add a very generous swig of olive oil and saute some minced garlic and onions until soft and fragrant. Add the clams and clam meat back in, and a cup or more of white wine. Reduce the wine and add in the broth and some spaghetti noodles that had already been cooked to an al dente stage. Season with salt and pepper, add lots of chopped parsley and you are done! How easy was that? Adjust oil if it looks like it needs it. Do NOT dry this all the way out. It should be moist, but not soupy. I love vongole, cook it at home, but I still order it when I’m in a restaurant. Cantinetta and Mamou does very good ones…. Doesn’t look like too much of a sacrifice. I’ll keep this in mind for this week. Have a happy ( and holy? ) week MM and family! “1.5 to 2.0 kilos of Liquid”? , maybe 1.5 to 2.0 cups of Liquid? 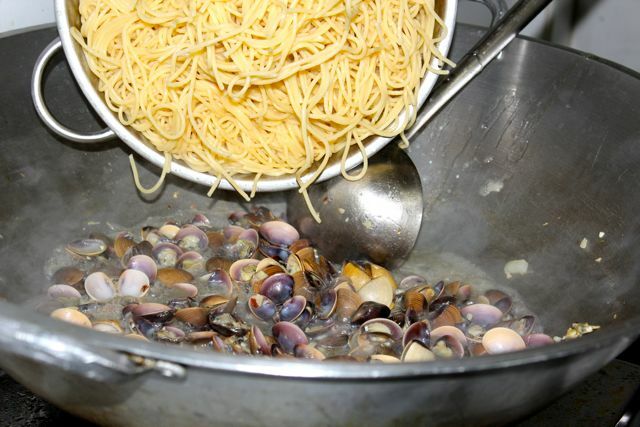 Hi MM :) I love linguine a la vongole but I’m a bit wary of the local clams. I had clams that were really gritty and sandy one time so that turned me off cooking them at home. Anyway my question is, what should be the salt to water ratio when I soak the clams? 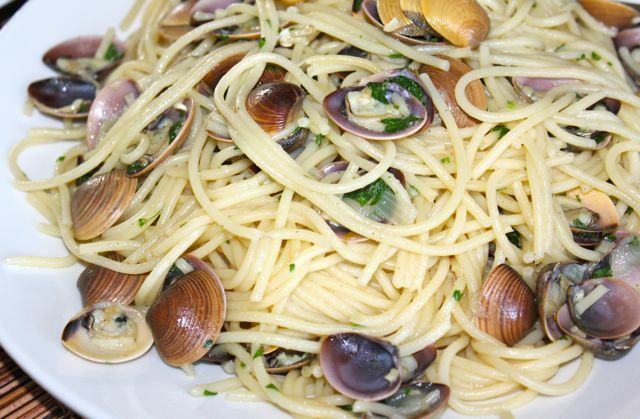 Vongole with lots of garlic and chopped parsley is one of my favorite past dishes. One of my favorites… prepare it with half olive oil and butter + crushed red pepper. i am just thinking of making this too!!! i can’t forget the vongole i had at Apt 1b. but, i am thinking of using scallops… yummy!!! What do they call this in Manila? There was once an abundant and very cheap type of clams called tulya that was the mainstay of Mang Nano and Bitoy’s table who invariably greeted it with “tulya na naman?” If these are tulya, I’d say they’ve come up a long way. I think they are what they call in Iloilo, “nylon shell.” Usually cooked “sinabawan” style or sauteed with black beans. Most of them come from Concepcion town or maybe some other coastal towns in Northern Iloilo and are harvested by divers illegally using compressors to breathe under water. The harvest is supposed to be regulated by the LGU’s but it seems like a free for all these days with local officials looking the other way, probably with some money involved. With tons being harvested daily, it is good business for the operators. Until it runs out. I love pasta vongole! 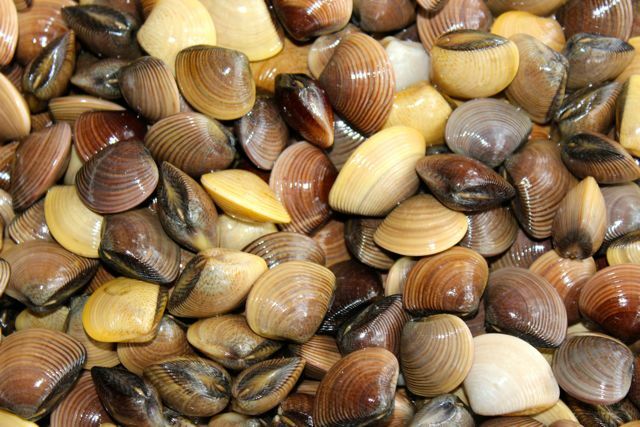 It’s kind of sad to learn that availability of good clams over there is spotty now. Especially considering that so many places here in the US refer to them as “Manila clams”. Like Millet, just love this dish with a lot of garlic too PLUS a good dousing of PLAIN BREAD CRUMBS AT THE VERY END. It tastes much like a Pancit Malabon without the toppings and the atsuete…simple yet good! Did these also squirt water at the market, like the tulya Footloose mentioned? I always had a good laugh seeing the shells squirting all over. Made sure I showed the kids too. Although I’m only used to seeing lighter, beige coloured Vongole clams, I have to admit that the clams look so (deliciously) beautiful. 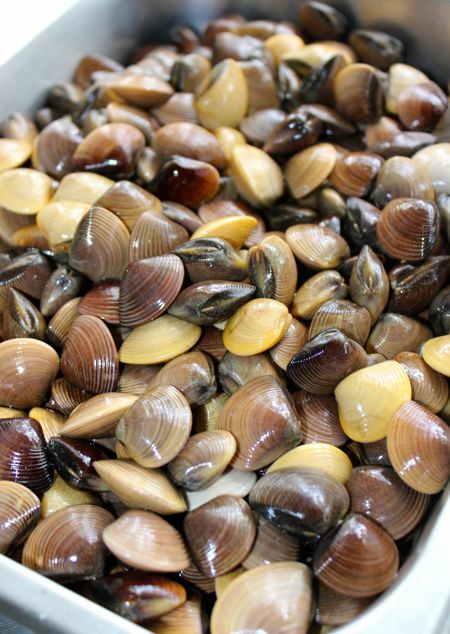 is the best tasting clam among the different species of clams available in the philippines. Those babies/beauties belong to the Venus clam family (Veneridae). The brown tones are Periglypta Magnifica abundant in the Pins! The yellow/golden ones could be Pitar Citrinus! www. indopacificshells.com…search Venus clams for those who are interested….gorgeous clam shells! Gej, these didn’t seem to be the squirting type, I have seen those in Manila… bettyq, yes, toasted breadcrumbs would be nice. friedneurons, the “Manila” clams in the states are mostly grown off of Vancouver, if I understand correctly… they were brought in from Japan, and previously transported from the Philippines. Any clams literally from Manila these days, as in Bay, would probably be close to deadly… :) rickyg, you are absolutely correct, thanks, it’s cups, not kilos, now to edit the post. Love that dish. Funny it was my first time to read that post about the “bad” clams. I am still laughing so hard right now. MM, where did you get those clams? P180 seems a trifle expensive for halaan., but then again, it’s Lent, when most seafood prices go heavenward. this post reminded me to make this today, and we got the clams at P50/kilo. i checked back whether i got your price right. bettyq, i used to brown the breadcrumbs very quickly in the olive oil, then taking them out before putting in the garlic, but it’s the pits when a few stray crumbs are left in the pan and they end up getting burned as the dish cooks, so i’ve resorted to frying them in a separate skillet instead, and scattering them all over just before serving. i know it’s not traditional, but i love the bit of crunch. Oh my! These look like grown-up tulya (or aren’t tulya baby clams of some species?) that is yummy “suwam” with sili leaves. Back in college, I went on vacation in my Mom’s hometown in Abra. We were bathing in the river under the huge Don Mariano Marcos Bridge when my fingers brought up tulya from the sand! We gathered 2-kilos worth and had tulya pasta for dinner. Nothing like fresh, clean clams from pristine waters. oh, thanks MM. i thought that was P180 per kilo! i saw some of these shells at the grocery today, i got scared cause some are open na… might be explosive na! Jamie Oliver cooked something similar when he had that roadtrip/cooking show across Italy and in one episode he spent time with and cooked for some fishermen in Venice. His version is almost the same as yours except that he added crushed tomatoes. Looks delicious and easy to make. @Footloose I think we call them “halaan” in P’que. In my father’s hometown however, the tulya we’re accustomed to seeing were of much smaller size. What Kind of Canned Milk?? ?